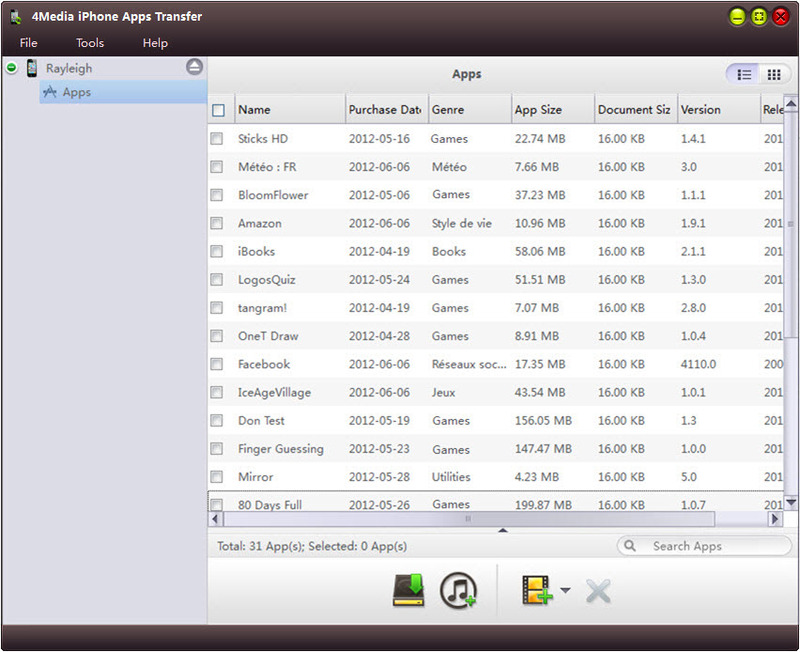 4Media iPhone Apps Transfer 1.0.0.20120803 Free Download - Manage and transfer app, add, save or delete app documents on PC. 4Media iPhone Apps Transfer offers the perfect solution iPhone app transferring and managing solution, which helps you copy apps to PC or iTunes, transfer apps back to iPhone, add, save and delete app documents easily. In addition, you can also drag and drop the apps, transfer them in batch, locate an app in one step. All iPhone models are fully supported, such as iPhone 4, CDMA iPhone 4 and iPhone 4S. 1.Support all iPhone models, i.e. iPhone, iPhone 3G, iPhone 3GS, iPhone 4, CDMA iPhone 4 and iPhone 4S. 2.Transfer apps in batch, you can transfer apps as many as you want. 3.Transfer apps by dragging and dropping, this improves the efficiency significantly. 4.All the apps will be showed up automatically as long as the iPhone is connected to computer. 5.With the app search box, you just need to input app name to locate the app(s). 6.name, Modified time and Size of the documents will be showed up when you choose an app. 7.Languages in English, German, French, Spanish, Italian, Simplified Chinese, Traditional Chinese and Japanese are available for the interface. Statement: First, please download the orginal installation package by clicking the download link. Of course you may also download it from the publisher's website. Using 4Media iPhone Apps Transfer crack, key, patch, serial number, registration code, keygen is illegal. The download file hosted at publisher website. We do not provide any download link points to Rapidshare, Hotfile, Depositfiles, Mediafire, Filefactory, etc. or obtained from file sharing programs such as Limewire, Kazaa, Imesh, Ares, BearShare, BitTorrent, WinMX etc. Software piracy is theft. If you like 4Media iPhone Apps Transfer please buy it.